WAF policy is a specific set of rules that protects the application. This policy is enabled by associating it with a virtual service. Navigate to Templates > WAF > WAF Policy to locate the default policy. System-WAF-Policy is the default policy in Avi Vantage that contains OWASP CRS 3.0 rules. Note: For customizing a policy, it is highly recommended to create a new policy instead of editing the default policy (System-WAF-Policy). To create a new policy, navigate to Templates > WAF > WAF Policy and click on Create. Name Enter a relevant name for the policy. Detection only — In this mode, WAF policy will evaluate the incoming request. A log entry is created when this request is flagged. Enforcement — In this mode, WAF policy will evaluate and block the request based on the defined default action. This default action is configured in the WAF profile. If configured, the specific action takes effect over the default action. It is recommended to use detection only mode in the beginning. For more details, refer to WAF Mode. PRE-CRS RULES: The custom rules that are applied before the supplied OWASP Core Rule Set (CRS). CRS RULES: The Avi Vantage supplied OWASP CRS policy that covers OWASP top ten attack protection. POST-CRS RULES: The custom rules that are applied after the supplied OWASP Core Rule Set (CRS). Each of these categories can have pre-defined set of rules that can be enabled or disabled using the toggle button. If a rule is disabled, then it will not be evaluated during the request check. Custom ModSecurity rules can be created under the PRE-CRS RULES and POST-CRS RULES categories. The three parts of ModSecurity rules are the variable to be examined, the test to submit the variable to, and the action to carry out if the test evaluates to be true for the selected variable. For more information on ModSecurity Language refer to the ModSecurity Handbook. Enter the required group name. 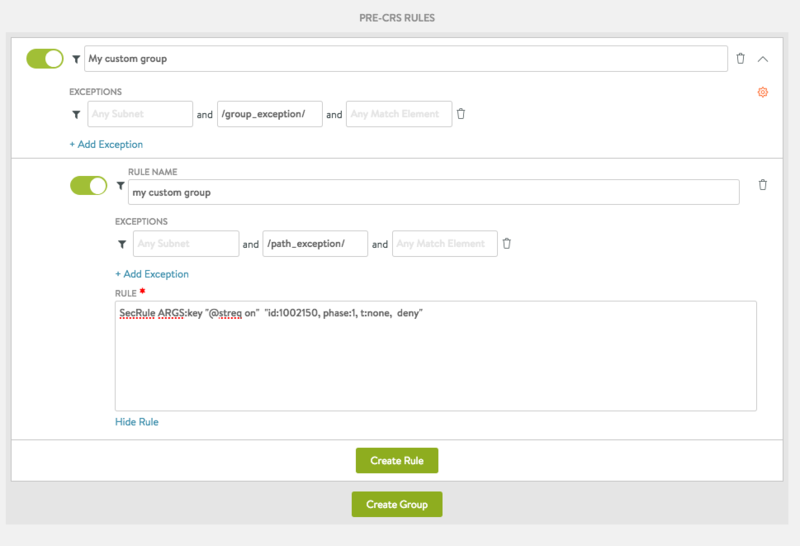 Every rule needs to be configured within a group. Specify the rule text in ModSecurity language. As displayed in the example below, SecRule REQUEST_URI “@beginsWith /admin” “id:1000,phase:request,block” is the rule text. On detecting external access on admin interface, this rule is configured to blacklist the URL. Post rule configuration, the allowed IP range for the internal IT department can be added as an exception rule, so that they can use the URL for admin access. Any group or rule can have one or more exceptions. For applications that do not conform with the System-WAF-Policy. For applications transmitting data that might appear like an attack. For instance, transferring HTML content in query parameters. For applications with special requirements that are not allowed in the policy. For instance, accessing application on its direct IP address. You can use Avi Vantage’s recommendation system to create exceptions or you can even add them manually. Click on + Add Exception to configure exceptions. These exceptions can be created on a group or rule level. With exceptions, a group or a rule check can be bypassed for the defined criteria. Exceptions can be configured for IP address/subnet, path, or any match element. For example, Subnet- 10.0.0.0/8, Path- /admin/ , Match Element - REQUEST_HEADERS. On adding an exception, a funnel icon will appear which indicates that a rule or group contains an exception. Exceptions can be deleted using the trash can icon. Using WAF Log Analytics and find possible false-positives. False-positives may occur in large numbers and for different client IP addresses. To understand the context for false-positives, consult the application owner if possible. In the log, choose the WAF Hit entry that you want to add the exception for, and click on + Add Exception. The modal dialog will generate a set of suggested values. These values are precomputed from the log entry and related findings. Save the exception to apply it to the policy. 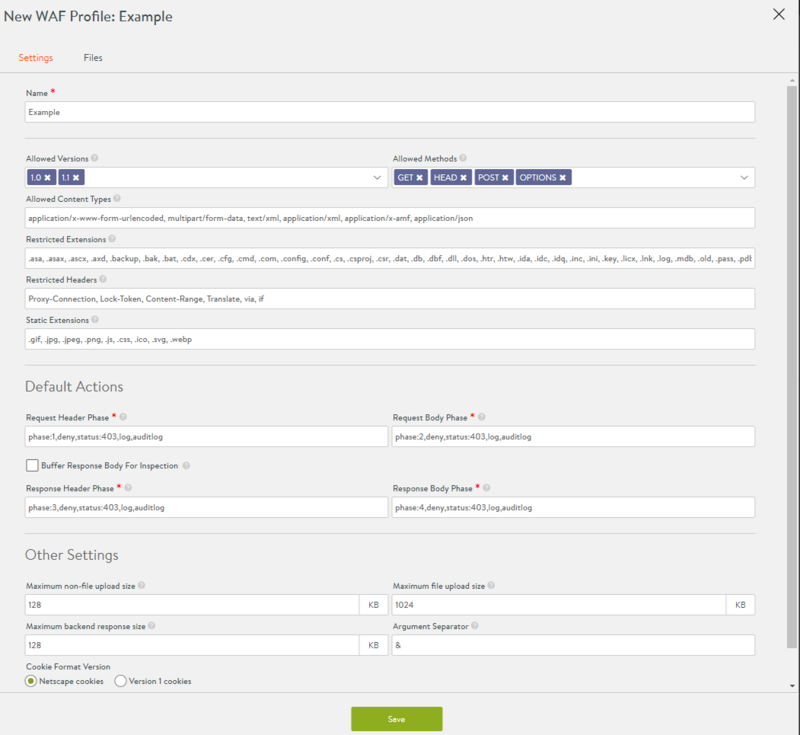 A WAF profile contains the basic settings for WAF functionality and is attached to a WAF Policy. As the profile is independent of the policy, it can be easily reused. Generally, WAF profile is defined for a specific set of virtual services and is reused to a feasible extent. Application Java profile: Contains all necessary elements for your Java applications. Application PHP profile: Contains all necessary elements for your PHP applications. API profile: Contains API specific settings. Navigate to Templates > WAF > WAF Profile to locate the default profile. System-WAF-Profile is the default profile that contains most commonly used web application settings served through a virtual service. Note: For customizing a profile, it is highly recommended to create a new profile instead of editing the default profile (System-WAF-Profile). To create a new profile, navigate to Templates > WAF > WAF Profile and click on Create icon. Name Enter a relevant name for the profile. Allowed Versions Enter the allowed HTTP versions for the profile. 1.0 and 1.1 are the default entries. Allowed Methods Enter the allowed HTTP method for the profile. Different applications might need different methods. Websites might use only the default GET HEAD POST options. APIs might use other HTTP methods such as PUT, DELETE, etc. 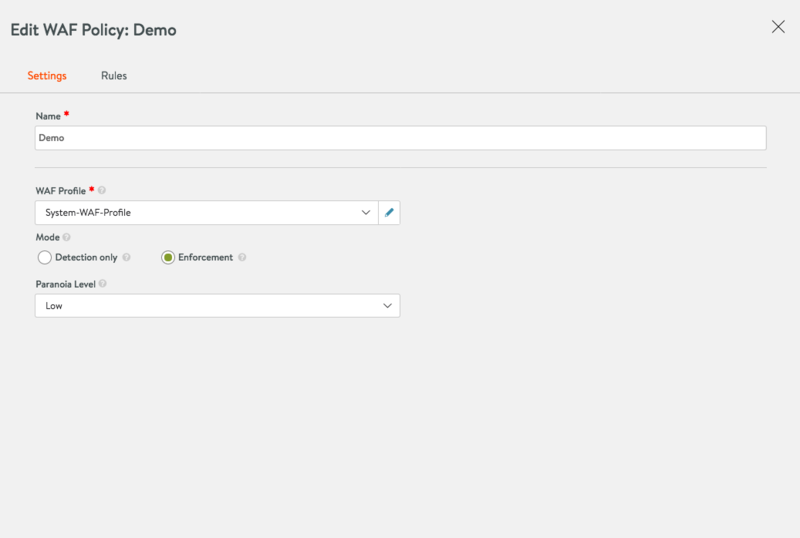 Allowed Content Types Enter the accepted request content types for the profile. Default entry covers all standard content types. Restricted Extensions Enter extensions that should be restricted and blocked. Generally, these are files that do not reside on a web server. Restricted Headers Enter headers that will not be allowed by WAF. Static Extensions Enter the list of static file extensions that will bypass the WAF check. A GET request without any parameter or dynamic part is classified as a static request. It does not contain any attack vector. Default Actions Request Header, Request Body, Response Header, and Response Body are the four WAF phases. Each of this phase has a default action. The fields defined for this default action are phase,action,status code,additional logging,WAF logs. phase Enter the WAF phase. Allowed values are phase:1, phase:2, phase:3, and phase:4.
action Enter the action to be executed for that specific phase. Two options are permit and deny. Cookie Format Versions Select the preferred cookie format version. Version 1 cookies have been deprecated and so Netscape cookies are recommended. The static input data in a WAF profile that is shared between virtual services is stored here. For instance, the file name sql-errors.data has the default data set which contains strings for examining HTTP responses for data leakage protection. To create a new file, scroll to the bottom of the page and click on + Add File. Provide a Name and enter the relevant Data. These files can be referred in the custom WAF policy rules. 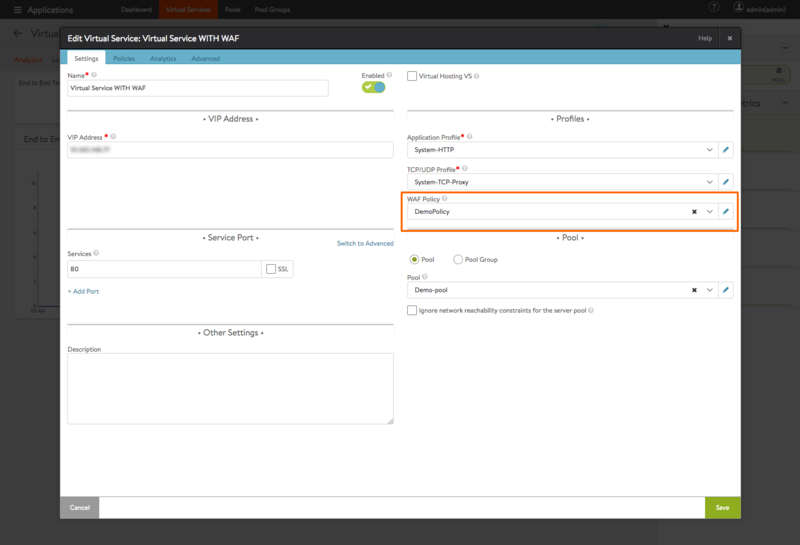 Each virtual service can have one WAF policy attached to it. Navigate to Applications > Virtual Services. Select the virtual service and click on the edit icon. In the Profiles section, click on the drop-down menu under WAF Policy, to either select an existing policy or to create a new one. Caution: Attaching a WAF policy to a virtual service, will immediately put that policy into effect. If the policy is in enforcement mode, then it will start blocking requests. So, for new applications and untuned WAF policies, we recommend running the policy only in detection mode initially. Navigate to Applications > Dashboard to verify if WAF is enabled on the virtual service. If enabled, you will notice a halo and a shield on the attached virtual service object. Detection only and enforcement are the two modes supported for a WAF policy in Avi Vantage. 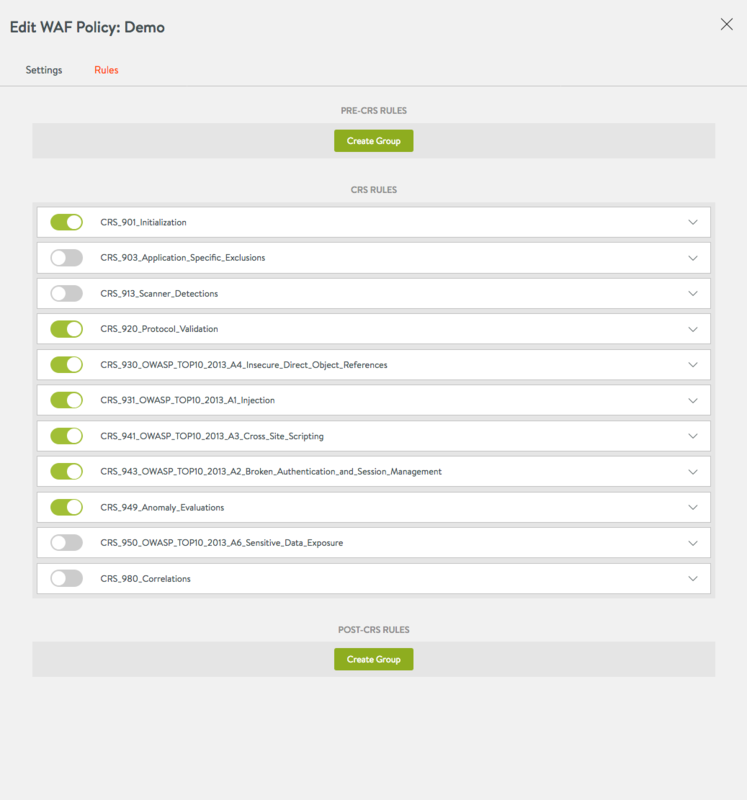 Every policy runs in one of these modes to evaluate the requests and responses. The following section discusses the differences between these two modes. Policy Logs alerts during an attack, but no deny action is taken. Rejects requests when a policy is matched and deny action is taken. Operation Evaluates the whole policy without stopping at the first rule hit. Matches the first rule that rejects the request and implements the default action or returns a rule specific error code. Log files Contains the WAF log section where the policy violation was found and entries for every rule that is matched. Contains specific WAF log section which has the first rule that rejected the request. Note: This is to improve performance. If a request is already detected as an attack, further checks are not required. Response Code 200 OK Default is 403 Forbidden. This response code can be modified. Follow the steps provided to enable a suitable mode for different usage scenarios. Create a virtual service for the application. Add WAF policy in detection only mode. Iterate through false positive mitigation. Eliminate WAF findings which are not attacks. Once no legitimate traffic is flagged by WAF, change to enforcement mode. Note: The time taken for evaluating detection only mode depends on several factors such as total number of requests seen, paranoia mode, and application coverage of request. Risk level of an application. Resources available for policy tuning. The following table maps paranoia modes to different risks levels and resource availability. For more information on paranoia mode, refer to OWASP ModSec CRS Paranoia Mode. WAF administrator role assigns users specific access to several components in Avi Vantage. This role differentiates access rights between the security team and other administrators. With this, the team can independently check the security status and implement policy changes. The WAF administrator role provides read access to essential components such as virtual service, pool, and pool groups. Components such as WAF profile and WAF policy are provided write access. To locate the WAF administrator role, navigate to Administration > Accounts > Roles. WAF-admin defines role access for all components as shown in the screenshot below.